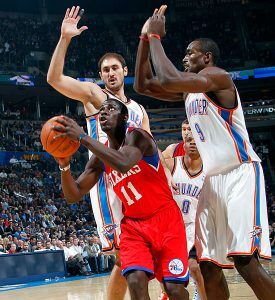 The 76ers (2-6) were defeated by the Thunder 109-103 Wednesday evening in Oklahoma City. OK, that part does make sense. But what doesn’t is why didn’t this OKC team destroy the Sixers? The Thunder were an unheard of 35-of-37 from the free throw line, 94 percent. Kevin Durant and Russell Westbrook were their usual all-star-selves the entire evening, each pouring in 31 points. Durant also hauled down seven boards while Westbrook dished out 12 assists. Oh and wait, I forgot to mention that Andre Iguodala was out for a second consecutive game. If I told you this information minutes before tipoff you would have gambled away your life savings that Thunder would have at least, at least won by 15 points and certainly covered the 11 point line Vegas put on this contest. I hate using the term moral victory more than the next guy but there are some very positive things to take away from Tuesday night’s loss. At one point in the second half, the Sixers looked as if they were headed for that lopsided loss I described above as Philadunkia’s home team entered the fourth quarter trailing by eleven. The Thunder kept attacking the rim, frustrating the undersized Sixers. Thanks to a Lou Williams shoulder injury (there calling it a contusion), Jrue Holiday was thrust into a scoring role and helped carry a 9-0 run to start the final quarter. More than a few of Holiday’s 11 assists were magnificent bounce passes, his six turnovers proved costly though. Holiday appears to get lazy at times on passes near the basket, which created effortless steals for OKC. Jrue also got caught in the Thunder trap of getting into foul trouble. He picked up his fifth foul right when we were making our final push, forcing ET into the point guard duties. Holiday fouled out in the closing minute, all but signifying the Sixers defeat. Quick note here…why Holiday (who had five fouls) was in the game with :34 remaining and the Sixers on the defensive end of the floor — guarding Westbrook no less instead of the inbounder — was a highly questionable move by Collins. Even so, the Sixers refused to call it quits and were able to cut the lead to 97-94 after a huge three pointer from Jodie Meeks. Yep, Jodie Meeks. I mentioned Sunday following our win over the Knicks that with AI9 out and Kapono away from the team for personal reasons, this could be Meeks’ one and only opportunity to prove himself to Collins. The second-year guard out of Kentucky looked as if he was back in a Wildcat uniform Wednesday night. Meeks dialed in 17 points in just 20 minutes on the floor. No other 76er — not even Lou Williams — has Meeks’ ability to hit three pointers with a hand in his face. Meeks assertively scored 13 of his 17 in the fourth quarter. As cliché as it is, he was giving 110 percent on the floor, something Doug Collins will take notice of. Meeks’ display was the main reason the Sixers were able to keep this game competitive. The problem with Meeks though is his size. At 6’4” he cannot play the three position. He’s quick defensively but you won’t see him grab many rebounds. And Philadelphia already has a similar player in Lou Williams. Plus Williams can handle the rock much more efficiently. Doug Collins has a surplus of scoring two guards, which isn’t a good thing. It clogs the rotation which usually causes streaky players to go cold in a hurry. In Evan Turner’s last five games he’s averaging nearly seven rebounds. Turner’s anticipation (with and without the ball) has noticeably gotten better over the past week. 15 points and eight rebounds is a very effective outing for a rookie without a true position. Turner is starting to find the spots on an NBA court that suit his game. He hit a couple of nice jumpers off of screens. The stat that we should dwell on the most were his zero turnovers. Especially impressive given that he was bringing up the basketball over 50 percent of his career-high 39 minutes. Good stuff kid. Oklahoma City played small with the Sixers all night without two of their big men Jeff Green and Nick Collison. Elton Brand benefited from this matchup collecting nine boards to go along with his 17 points and five assists. Brand’s four game streak of scoring 20 plus was snapped. I would have liked to see him take a more active role in the fourth quarter offense. It looked as if he was fatigued. That’s something I’ll pay closer attention to Friday night when we take on the Mavericks. Once again last night, Doug Collins chose to wait until the third quarter was dwindling down to insert Tony Battie into the game. Battie played a large part in last Sunday’s win at Madison Square Garden with his defensive presence and clutch rebounding. It’s clear that Collins doesn’t trust Hawes or Speights in the fourth quarter and that he is saving the aging Battie for the second half of games. But I think it’s unfair to Battie to throw him in cold that late in games. As much as I think he’s highly overrated, Andres Nocioni was the only member of the team with a positive +/- ratio. He had 12 points and I would say his second best game of the season (Cleveland was his best). Too bad Durant made him look foolish at least four times last night. Stat I Love: The Thunder were 2-of-14 from three-point-land. Philadelphia’s perimeter defense has improved drastically since the beginning of the season. The Knicks were also muted from beyond the arc last Sunday. I’m holding my head high after this loss and so should the rest of Philadunkia nation. 1) With 2:35 remaining in the game and the Sixers trailing 99-96, the Thunder had a sideline inbound to execute with :01 remaining on the shot clock and to say they executed with precision is an understatement. A back pick for Westbrook and a perfect pass Sefolosha led to a wide open alley-oop for the OKC guard and a 101-96 lead for the Thunder. The Sixers simply can not have that type of breakdown at that moment. Everyone in the building knows the play is coming as it’s the only way to score with :01 remaining and we’re sure Collins went over it during the timeout. The Sixers never got the score within one possession again. 2) With 1:00 remaining in the game, the Thunder isolated Kevin Durant on the wing (guarded by Turner) and cleared out for him. What happened next was simply ugly defense. Durant put the ball on the deck, turned the corner on Turner (thanks to an elbow to ET’s face and the fact that Turner didn’t seal off the baseline), the weakside help was late and Durant laid the ball in and got an AND 1. The play and made FT put OKC up 104-97.